How do I create debits and credits manually? Getting all of your transactions to reflect in the correct categories is a must for accurate reporting. 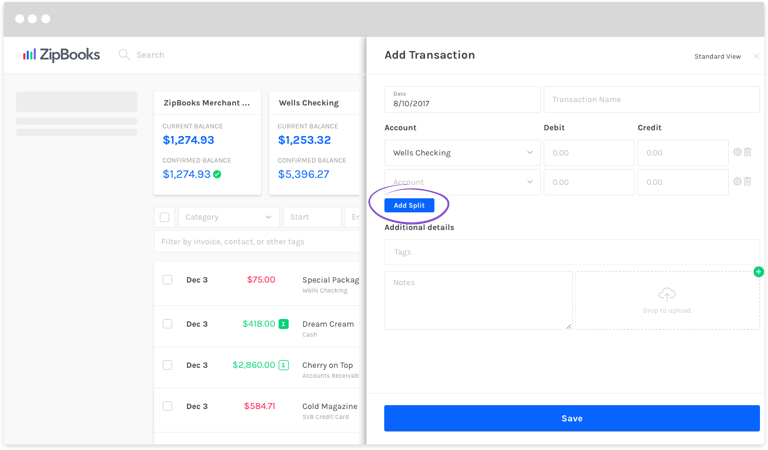 That’s why ZipBooks gives you the Advanced View option of adding transactions, so that you can manually enter debits and credits for more complicated transactions. 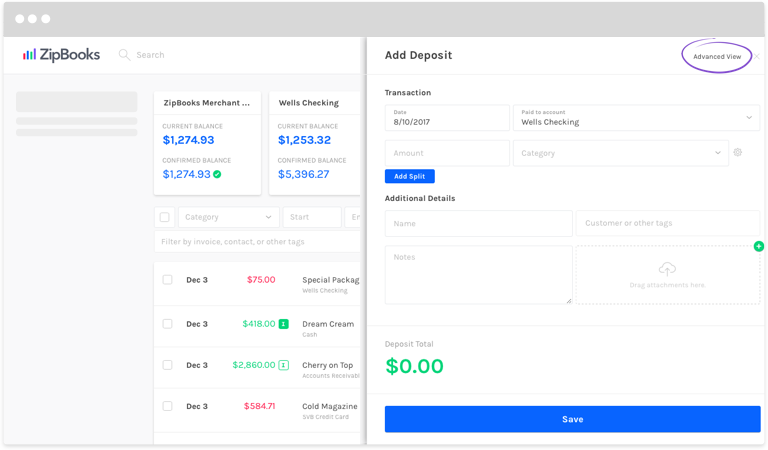 If you need a review on double entry accounting before you use this feature, check out this article. Sign in to ZipBooks and click on Transactions at the top of your screen. Click the round green ‘+’ button toward the top right corner. Four colored buttons will appear. Click the on the button that describes your transaction (Deposit, Expense, Transfer), or click the Custom button if you’re unsure. A new screen will slide in from the right. No matter which option you chose, click on the Advanced View link in the top right corner of the screen. The Add Transaction window will appear. Add a Date, and the Transaction Name. In the next section, you’ll be specifying which accounts are debited and which are credited in your transaction. Click in the first Account field, and a dropdown list will appear. Choose from the list, or simply start typing in the name until only the account you want is left in the list. Enter the amount of the Debit or Credit in their respective fields. If your transaction has more than just one debit and one credit, click the blue Add Split button to include additional lines. Add any Tags, and Notes that apply. If you’d like to attach documents, click the round green ‘+’ button, or find the files in your computer, and drop them in the Drop to upload space. And you’re done. In your financial reports, this transaction will be allocated to the accounts you designated.